People with Disabilities are making great strides as are the opportunities for them to participate in the community just like everyone else. We see people with disabilities running successful small businesses, competitively participating in sporting events, writing books, creating commercially viable art and basically everything that those typically-abled do and take for granted daily. What we don’t see regularly is a way to recognize and learn about these people and opportunities. Enter the Exceptional Experiences Expo. One day to celebrate the people and opportunities that aren’t letting disabilities stop them from living their lives to the fullest. Our goal is to showcase these people and opportunities to a larger audience. Maybe educate the larger community about the resources that are available. Exceptional Entrepreneurs, community groups, sports leagues, performance groups, artists and others. Our short term goal for the first E2 Expo is to promote and execute a successful event. To that end we’ve decided to invite those who we feel are making a serious impact to participate in year one. With the large amount of people and groups this will be a tough decision and we will try to accommodate as many as we can but even with the generous support of The Museum of Disability History, space will still be limited. Our long term goal is to be able to host multiple events throughout the year and to bring awareness to the disabled community and help in any way we can! 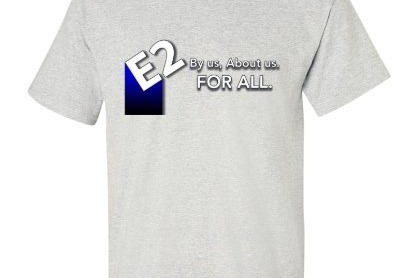 we want to keep the event free for as long as we can and in lieu of big corporate sponsorships that skew the original intent, we want to keep the event pure but we have to pay for advertising costs, rentals, tables, etc....every donation of $50 or more comes with an E2 t-shirt!